MANILA – President Rodrigo Duterte on Tuesday said the amnesty granted to Oakwood mutineers, including Senator Antonio Trillanes IV, was one of the glaring mistakes of the previous administration of former president Benigno Aquino III. “Pagka mali is mali. Hindi mo talaga ma-correct ‘yan (If it is wrong, it’s wrong. You cannot correct that) and one of the glaring mistakes of the Aquino administration was to extend an amnesty,” Duterte said a tête-à-tête with Chief Presidential Legal Counsel Salvador Panelo at the Malacañang Palace. Duterte said the procedure in the issuance of Proclamation 75 by Aquino in 2010 was “totally wrong in the sense that he just issued the proclamation” without giving particular names. “It was a motherhood statement to cover the individual and any of the acts of the mutineers,” he said. Duterte also blamed Aquino for designating former defense Secretary Voltaire Gazmin to investigate and sign the amnesty itself. “You know, it is not possible to do that. Why? Because an act of pardon or amnesty is an act of State. It cannot be delegated to anybody but to the person or the President himself,” said Duterte, a former fiscal. He said the granting of amnesty as well as declaring martial law suspend the privilege of the writ of habeas corpus and to call for Congress' special session is the exclusive power of the President. “An act of amnesty is always an act of State which cannot be done by a mere Cabinet member. Especially if that Cabinet member was the one or was the one of those who investigated and made the recommendation and approved the recommendation himself,” he said. He said if the Supreme Court would disagree with him “that is a new development on jurisprudence and I would accept it”. Duterte signed his own Proclamation 572 on August 31 to declare void ab initio (from the beginning) Trillanes’ amnesty “because he did not comply with the minimum requirements to qualify under the Amnesty Proclamation”. 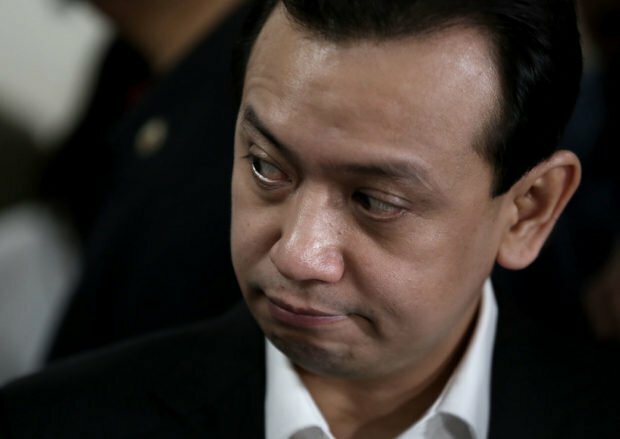 Trillanes did not personally fill up and file the official amnesty application form and has not expressly admitted his guilt for the crimes he committed during the Oakwood Mutiny in 2003 and the Manila Peninsula Siege in 2007. Duterte claimed Gazmin, whom he described as his very good friend, signed Trillanes’ amnesty because the former defense chief wanted to protect the former president. “He was actually protecting Aquino. And there are – all the time sa lahat ng ano, they were protecting Aquino,” Duterte said.